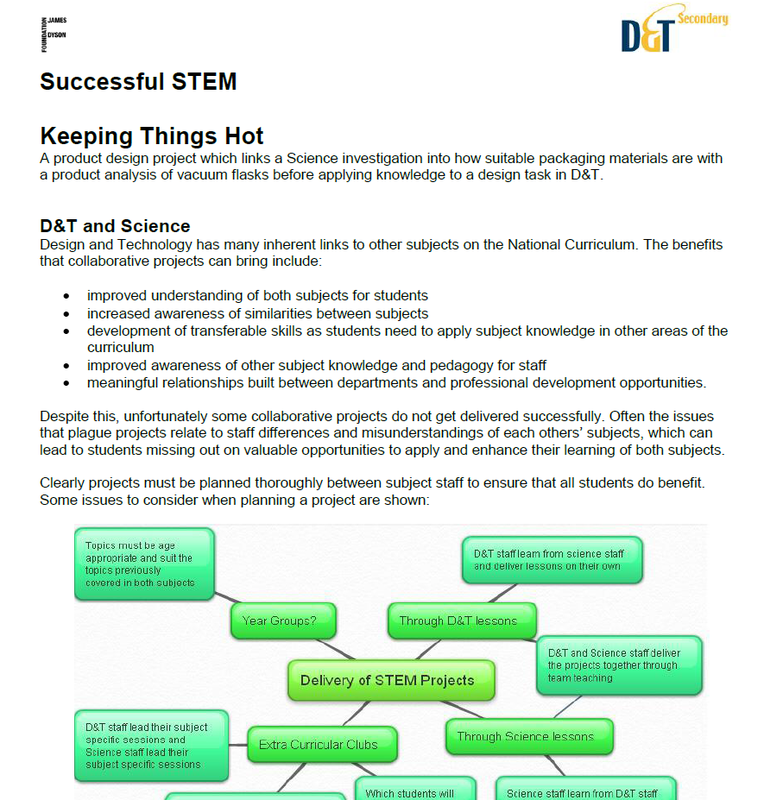 These resources include five projects which aim to inspire D&T and Science teachers to run collaborative projects between the two subjects and ensure that you can successfully deliver a STEM project to enhance the learning of your students. These examples were first taught by D&T teachers, however all rely on knowledge, resources and equipment from Science departments. 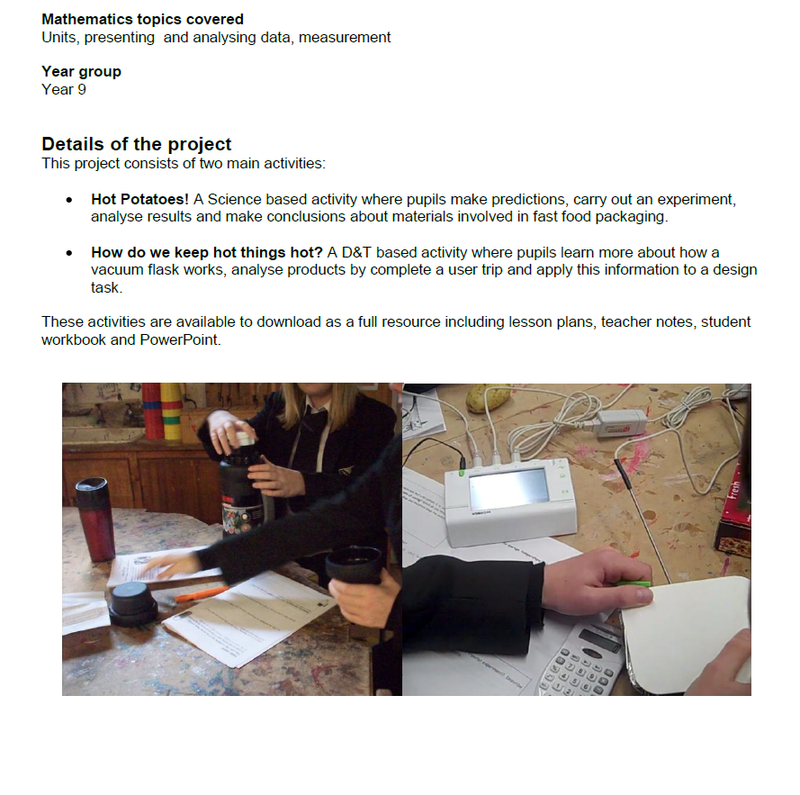 Each has an introductory page, summaries of the D&T, Science and Maths aspects covered, details of the project and the school’s experience of planning an delivering it. Sound and Vision – Year 9 A product design and electronics project where students produce an mp3 amplifier kit and study sound waves before making a it into a portable speaker unit. Speedy Boats – Year 9 A product design project where students look at the hydrodynamics of boat hulls before making their own and testing it in a water test tank. Keeping Hot Things Hot – Year 9 A product design project which links a Science investigation into how suitable packaging materials are with a product analysis of vacuum flasks before applying knowledge to a design task in D&T. Welding with Chocolate – Year 8 A structures project where students consider joining methods used in bridges before making a plank and box girder bridge and then test to destruction. Communication – Year 7/8 A project where students work together to investigate the structure of the ear and how we hear things before manufacturing a giant ear for demonstrations.